Rudolf K. Jeske - Edmonton's Burial & Cremation Professionals | Trinity Funeral Home Ltd.
Rudolf Kaismir Jeske was born in Schwienkuhl (northern Germany) on May 8, 1915. Soon thereafter his family moved to West Prussia (currently Poland). In 1930 he traveled with his father to Canada to build a new life for the family. For five years before the rest of the family arrived, they cleared land and built a homestead in the Mystery Lake area of Alberta. Through the witness of his mother, Henrietta, he and his brother Albert made a personal decision to follow Jesus as their Lord and Saviour in 1937. This was to impact him profoundly for the rest of his life. As a young man he built barns with his brother and then established a company to build houses. During this time he moved to Edmonton and then by the mid-sixties he transitioned to the shoe repair and sales business, which he continued at until his retirement in 1980. Rudolf married Dorathea Martz in 1946. They were married for twenty-five years and had five children. 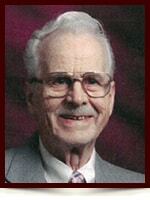 It was Dad’s great joy that each of his children had also made a commitment to follow the Lord. In 2000, he married Maria Mae, and they spent several years of companionship together until she passed from this life in 2006. Rudolf Jeske is lovingly remembered by three daughters and two sons: Rita Goodmund (Gord), Bernie Jeske (Shirley), Christal Rusnell (Walter), Anita Jobs (Hein), and Phillip Jeske (Nancy); seven grandchildren: Cal, Kirk, Quinn, Tina, Ryan, Stacey, and Alysia; as well as twelve great-grandchildren. Rudy, as he was known by his friends, served for many years at the seniors home, Shepherd’s Care. It was his joy to help out where he could and share the love of Jesus with those who did not know the same joy of salvation that he had experienced. He was ushered into eternity on May 29, 2017. For those of us whose lives he impacted, we consider ourselves blessed to have had a steadfast father, grandfather and friend who faithfully walked the journey of life before us.